Nikita Kucherov scored the most points and co-led the league in goals scored, two of them consecutive game-winners, for the Tampa Bay Lightning, as he now sits just one point away from 100 (his 99 tops the league) on the campaign. 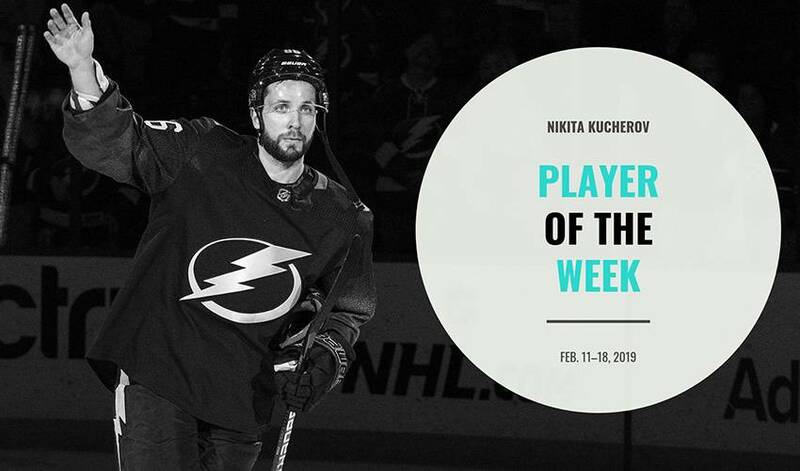 Kucherov, who entered the week off a three-point game against Florida (February 10), kept his hot hand going, giving the ‘Bolts a big-time jolt with his impressive offensive output, including one goal and six helpers on the power-play. Kucherov’s week got off to a lightning-quick start, as the 24-year-old led Tampa to a convincing home win over the high-powered Calgary Flames. For his part, Kucherov took 20 shifts and saw 18:10 of ice time in the victory, notching an even-strength goal and a pair of assists via the power-play. “He has that ability to find guys even when I don't think guys know they're open,” Lightning coach Jon Cooper said. Kucherov and Brayden Point (72) became the second pair of Tampa Bay teammates to reach 70 points in 57 team games. (Martin St. Louis and Vincent Lecavalier achieved the feat in 2006-07). What to do for an encore? How about a little déjà vu for Kucherov? The Russian followed up his one goal and three assists effort against Calgary with the very same line against the Dallas Stars. Kucherov’s Valentine’s Day gift to Lightning fans included two power-play assists and First Star honours (again) in the convincing home win. He became the first player in franchise history to reach the 90-point mark before the 60th game of the season and is the fifth player in the NHL to achieve the feat since 1998-99. Kucherov also became the first player in franchise history to record at least three points in three consecutive games. On a night where he missed netting the First Star natural hat trick nod – that honour went to teammate, goaltender Andrei Vasilevskiy – Kucherov still managed to make his mark with another stellar offensive showing. While Vasilevskiy turned aside all 20 shots he faced, Kucherov was up to his usual point-producing ways for the Lightning in what was their second straight home shutout. He netted the game-winning goal against the Habs, scoring 2:15 into the final frame, before forcing a turnover that led to a Yanni Gourde goal just 1:25 later. Kucherov also recorded his 50th career power-play goal, moving him past Brad Richards for fourth-most in franchise history. Kucherov capped his brilliant week by being in on all five of Tampa’s goals in a dominating road win in Columbus, helping the Lightning to its sixth straight victory. Kucherov certainly got the point(s), posting his second straight game-winning goal, along with two helpers on the power-play. Columbus dominated and outshot Tampa 19-6 in the first period, but Kucherov scored twice. His first tally came with 8:42 left in the frame, and he then grabbed a turnover in the neutral zone and lit the lamp with 5:36 remaining for his 29th of the season. The all-star, who is no doubt in the mix for early Ted Lindsay Award consideration, now finds himself on the cusp of a 100-point campaign, just one shy of the milestone.